The idea of subscription agriculture was born in Japan over 50 years ago, when people there became increasingly concerned about the growing amount of imported food and the decline of local farming. Known in Japanese as “teikei” (meaning “putting the farmer’s face on food”) the concept took hold in the United States during the mid-1980’s as ‘Community Supported Agriculture’. It flourished in New England and has become increasingly popular among consumers wanting farm-fresh, locally-grown produce. Today there are well over 12,000 active CSAs across the country, many of them supplying organically-grown food. Participants in a CSA farm pay in advance before the start of the season for a share of the farm’s harvest. In turn, they receive a portion of farm products each week (or biweekly) throughout the growing season. Prepayment gives the small farmer operating capital for the year’s production, and helps the farmer plan the planting and harvest schedule. Shareholders not only share the bounty from the farm– they also share the risk. If there is a crop failure (such as from disease, a hurricane or major freeze), the shareholders agree to take the loss with the farmer. Here in South Florida, our season lasts about 5 months from late November through mid-April (10 to 20 deliveries over 22-23 weeks). As a subscriber of a Community Supported Agriculture farm, you can help support local small farms, boost the local economy, as well as provide your family with healthful, fresh produce. We are not a supermarket! 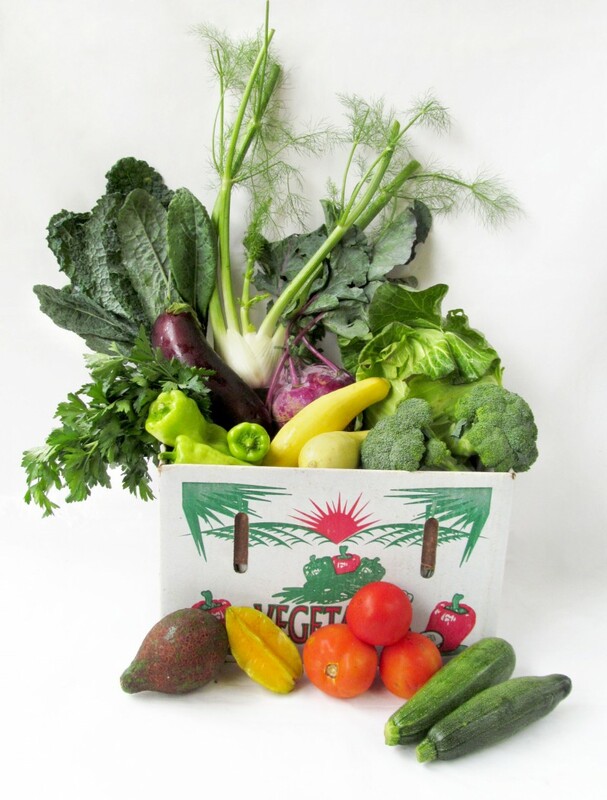 The vegetables that you find each week in your share are what we are harvesting at that time. You are NOT able to pick and choose as in a market. Part of the commitment is learning to eat what is in season here in our local area- you will become more flexible and adventurous with your cooking and eating habits. Each crop has a preference for certain growing conditions. There are some things that we cannot grow at all, and others that have a very limited season in South Florida. Note that we always have greens- for salads, cooking, or both, and some type of herb(s). Although high season for tropical fruit is summertime, we include winter fruit as often as possible. We also offer the opportunity to order other items not included in your share, or bulk quantities of something that is currently abundant. The selection changes during the season- at the beginning, you may find predominantly greens and herbs that mature quickly. Later on, you will see more of the long-season items such as root vegetables (See what’s available, when). 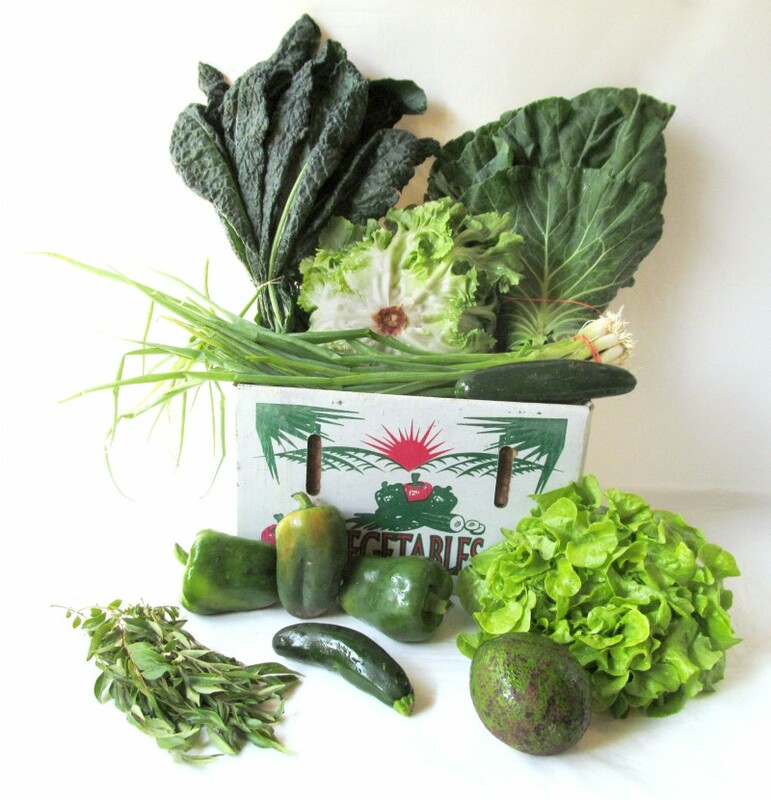 We offer a biweekly FAMILY share, which usually satisfies the produce needs for a plant-centric family of 2-4. Biweekly subscribers receive a share every other week. Large households, juicers, or big veggie eaters can sign up for more than one share, or multiple families can split a share. In addition, you can buy additional items from our webstore, to accompany your share on your delivery day. We include tips and recipes to help you take advantage of the seasonal vegetables, especially the unfamiliar ones, in the weekly newsletter that comes with your share. Our newsletter archive is accessible online, so you can look up those old newsletter recipes you accidentally threw away! Below are some photos of various shares throughout the 2012-2013 season. Clicking on each photo will take you to its respective newsletter for that week. Pick up at Bee Heaven Farm at no additional charge. We also offer add-on share options such as: Eggs, honey, fresh pollen, local farmstead goat cheese, Mediterranean food, and locally-crafted bacon. Prices vary with options chosen. Full details are provided during the enrollment process. Commitment for payment in full in advance IS REQUIRED**. Enroll early and use our installment plans. Guarantee your spot by enrolling prior to October 1st. You may pay online or mail in your payment. NOTE: You will NOT receive a share until you have paid in full, and there is no makeup for a missed share. Read our farm policy here. **SNAP/EBT (food stamp) customers commit for the full season, but must pay in person with their EBT card 1 or 2 weeks in advance of the next pickup. Therefore, you must pick up your share at the farm or at a location where we can physically run your card. Contact the farm for more information. 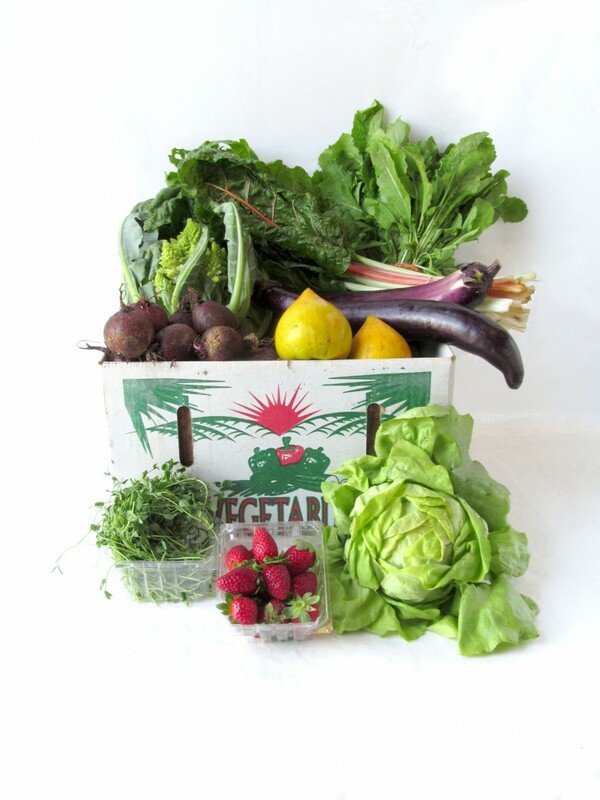 Sign up NOW for our winter CSA program! Pick up in Miami-Dade locations on Saturday- the time depends on the pickup site location. Florida Keys shares are delivered Friday afternoon. When you sign up, you can choose to pick up your share at the farm or at a designated pickup site. Our farm is located approximately 3 miles north of Homestead, in the heart of the Redland area near the Fruit & Spice Park. We also have pickup sites in Cutler Bay, Palmetto Bay, South Miami, Coconut Grove, El Portal, and locations in the Upper Keys. Choose the location most convenient for you when you sign up. When you arrive to collect your share, you will find a sign-in sheet. Sign in and make sure you take the correct size box for your share (FAMILY, SMALL, or MINI), and any share options and additional orders you’ve purchased. These extra items will be clearly labeled with your name. Please return your box each week so that we can reuse it and keep our costs down. We will email your share newsletter Friday afternoons or evening, so you need to make sure our emails are not diverted to spam. If you need to skip a distribution, you can have a friend pick it up for you, or you can donate it. Per our farm policy, there are no makeups or refunds for missed shares. If you would like to volunteer your home or place of business as a designated pickup site, please email us. To be designated as a pickup site, we MUST deliver at least 15 shares there. A site may be almost any place that is accessible and has an air-conditioned space or a shady porch where we can place our coolers and boxes for our members to pick up their shares. You also need to have a place to store the flattened boxes until we swap them out the following week. 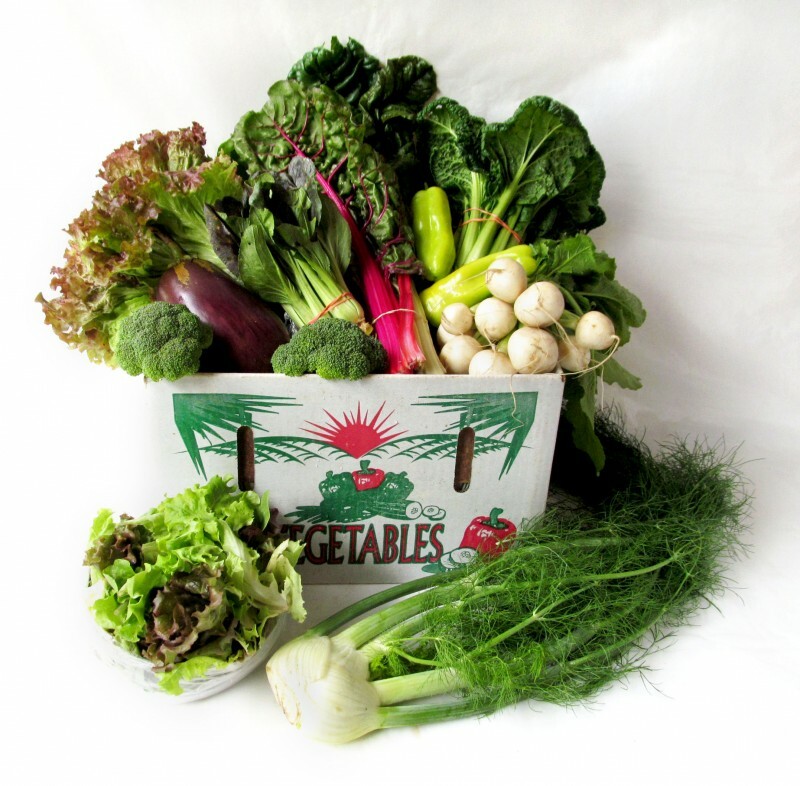 The most common reason given for quitting a CSA is that you cannot use all the vegetables. Be realistic about your family’s lifestyle: if you eat out often or use a lot of prepared food, this may not work for you. If you live by yourself and you think a share may be too much produce for your needs, consider juicing, opt for a biweekly share, or split your share with a friend. You can take turns picking up or each take half the items-get creative! Our customers vary from students to singles to families to retirees. Some are vegetarians, some are vegans, some juice, some follow a raw, live foods lifestyle, but most are simply interested in fresh, locally-grown, non-GMO, organic or pesticide-free, flavorful food. For many, this is a new way of cooking and eating. They find that they make more foods (such as pesto) “from scratch”. They also are willing to try new foods and ways of preparing them. If you’re not used to eating a lot of fresh produce, you will change some things about how you prepare and cook food. To help you make the transition to cooking and eating this way, we suggest getting a good vegetable cookbook. Some of the best are designed for vegetarian lifestyles, but even if you eat meat, you will find great recipes, often for the more uncommon vegetables you’re likely to see in our shares (but not at the grocery store). We offer a selection of cookbooks on our webstore showcasing local, Florida foods, along with the farmers, artisans, chefs, and their recipes. You can also check out your local bookstore, library, or the internet for recipes. And keep an eye out for the recipes in our weekly newsletter . Many CSA programs recommend a salad spinner. Although handy for leafy greens, we find the easiest way to clean your veggies is to soak them briefly in a sink full of cold water, swish them around a few times, let rest for a minute (so the sand and dirt will sink to the bottom) then drain well in a colander. This is especially useful when the veggies are sandy, or stowaway critters have hitched a ride. But to keep your greens at their freshest, DON’T wash them until you’re ready to use them. This is why you’ll often find a bit of our farms along for the ride. Always store your greens in a plastic bag inside your refrigerator’s vegetable drawer, never loose on a shelf. Juicing is popular nowadays. This is a great way to process an abundance of leafy greens, including lettuces, for a quick, nutritious boost. A good juicer is essential. You can opt for a machine that separates the pulp/fiber from the juice (in which case, save the pulp/fiber to put into soups, thicken stews, or use in baking for added nutrition. My personal favorites are macerating juicers, which do an excellent job and are very easy to clean. We also recommend that you start a compost pile or bin. You will probably have more vegetable waste than you’ve had in the past. If you have a yard (even if you only grow plants on a balcony), the best way to use these scraps is to recycle them by making compost that to use on your plants. You don’t need anything fancy– a small corner in your garden will do. Just be sure that when you put your scraps out, you cover them lightly with a top dressing of soil, and don’t forget to add the trimmings every time you cut grass or trim your plants. If you pick up your shares at the farm, and don’t want to or cannot keep a compost pile, bring us your veggie trimmings to add to our compost pile, helping us close the cycle of sustainability. You can accumulate your scraps in a container inside your freezer until you have enough to bring. Some local farmers markets also accept your scraps to return to the farm. Another option is vermicomposting- using worms to compost your trimmings. A properly-maintained vermicompost bin can be kept underneath your sink and will have no odor. The resulting worm castings make a great soil conditioner. We start planting in September, and will have most of our seeds, supplies and plants ordered by then. If you want to be assured of a place in our program this season, please apply and pay early. Your spot is not guaranteed until we have received payment, and you must pay in full before the start of the season. No refunds of any kind are given after November 1st (see our farm policy). If you would like to eat farm fresh organic and pesticide-free produce grown here in South Florida, please make your commitment NOW! Not in Miami-Dade or the upper Keys? 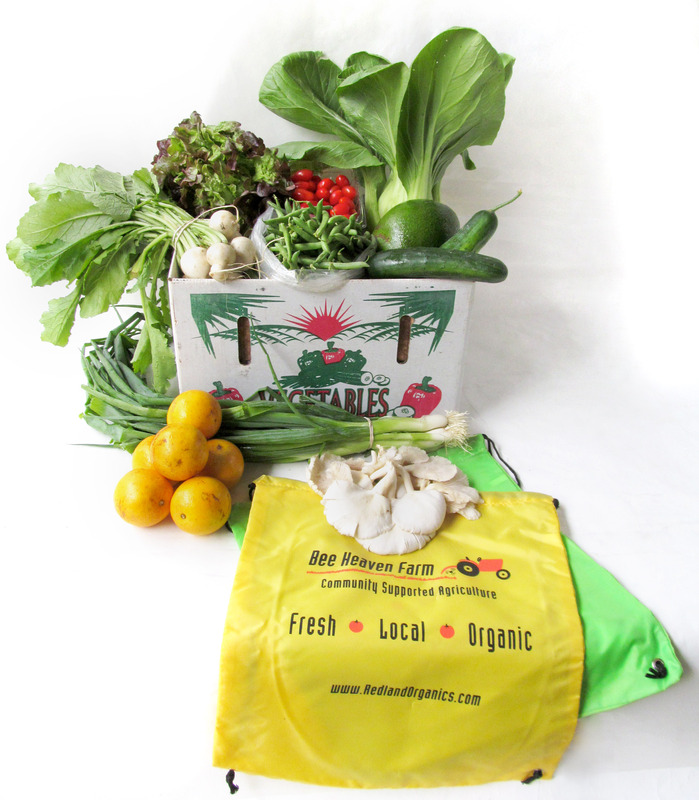 One of our own Redland Organics member farms offers a CSA in Southwest Florida! Check out Worden Farm, based in Punta Gorda. The Wordens have partnered with us for 17 years, since they got their start here in the Redland area. They grow and supply a lot of the food in your shares, and are USDA certified organic. 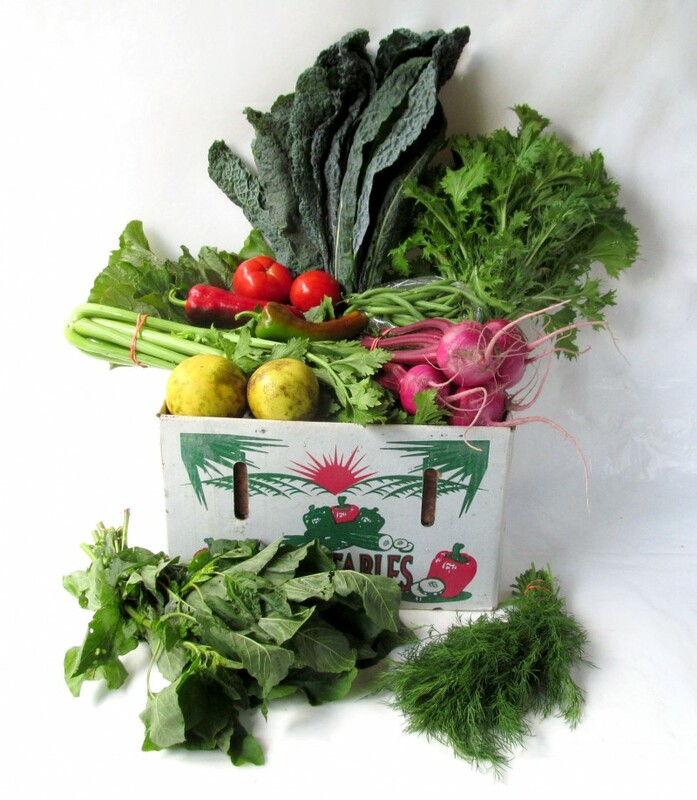 There are other local CSA farms in Miami-Dade: examples are Little River Cooperative (organic practices, but not certified), and Nana’s Greene CSA (not organic). There are also buying clubs, some calling themselves CSAs, but these are simply purchasing groups buying their produce from distributors. They are not farmers, and the ‘local’ produce they provide may come from larger farms via out-of-town distributors. For other CSA locations, check out Local Harvest (localharvest.org). They have an excellent locator resource – simply enter your zip code to find farms, CSAs, markets, restaurants and more near you.